How Do I Clean My Samsung Camera Lens? Cleaning your camera lens is easy, but a couple precautions need to be taken to avoid damaging the lens. • Do not use facial tissues, paper towels, or other types of paper. Facial tissues have a rough texture and will scratch your lens. 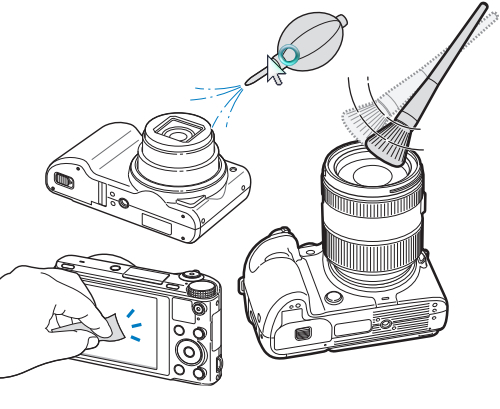 • Never use bezene, thinners, or alcohol-based cleaners (including hand sanitizer) to clean your camera. These solutions can damage the camera or cause it to malfunction. 1. Depending on your model, power on your camera or remove the lens cover. 2. Use a soft brush or blower brush to remove dust, and then wipe the lens gently with a soft cloth. 1. Add a few drops of lens cleaning fluid to a lens cleaning cloth or lens cleaning tissue. 2. Gently rub the dampened cloth or tissue on the lens, moving in a circular pattern. 3. With a dry lens cleaning cloth, gently dry the damp areas of the lens. 4. Repeat until the lens is clean. NOTE: You should be able to purchase lens cleaning fluid, lens cleaning cloths, and lens cleaning tissues at most electronics and camera stores.